This is one of the best lubes. It goes with just about anything. All of our friends love this kind of lube. Everyone should have some! We have tried many of lubes before, and we believe this is the best one. I know she really enjoyed it. It added a lot more sensitivity, and according to her, it makes the woman's area feel a lot more cooler. I liked the fact that to me, it felt warm. We really enjoyed it though. 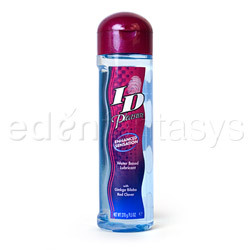 This ID Pleasure Lubricant comes in five different sizes. The sizes are; 2.75 fl.oz. which costs $7.99, 1 fl.oz. which costs $5.99, 5.5 fl.oz. which costs $10.99, 9.5 fl.oz. which costs $15.99, and 2 fl.oz. which costs $7.49. This unflavored lubricant is a water-based lubricant that can go with pretty much anything. The only type of products this lubrication is not compatible with are waterproof toys. Would not use in the bathroom because the water will just dissolve the lubricant, and will pretty much be a waste of your money. The top to this bottle is one of the open and pour, or easy pour, type bottles with the little opening when you pop the top open. Kind of like a Hershey's Syrup bottle or shampoo and conditioner bottle. ID Pleasure is made L-Arginine free for safety and is made by I-D Lubricants. When it comes to this lube, there is no smell whatsoever to it, and again, is unflavored! We know plenty of people that have tried so many different lubricants, and have told us that this (and a few other water-based lubricants) are the only ones they are able to use because they would break out and get rashes from others. We agree with them when we say this is one of the best lubes. Everyone should have a bottle of this sitting with their stash for the next time they have their fun time, even if it is just the small bottle!